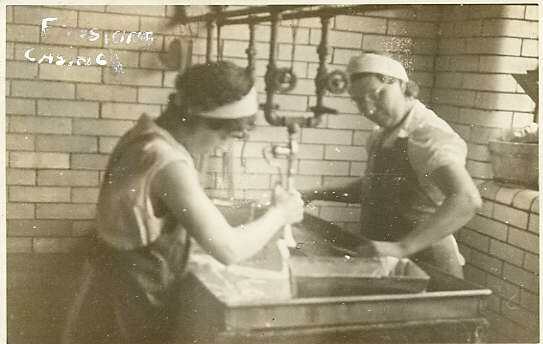 “My grandfather started with a butcher shop…on the corner of Lombard and Exeter. It was a retail butcher shop…[and] they lived above the store…. Then a company was formed…. [named] Consolidated Beef and Provision Company, also known as CeeBee…. [The property ran] down Lombard street towards Wartzman’s bakery and then along, up Exeter Street to the middle of the block. Initially, I believe…their property [was] 104, 106 South Exeter Street where the first plant was built, loading right from the street…. The first floor was where they handled the beef. 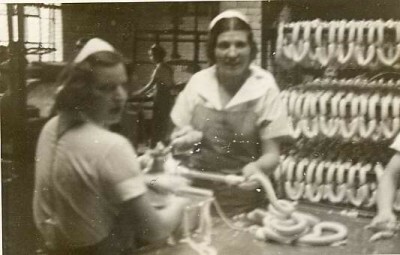 The second floor was where they handled processing, manufacturing of all kinds of meat products – bolognas, sausage, meatloafs, curing hams. Course the curing was done in the basement. And on the third floor is where another area where the…manufacturing of the meat products took place…[and] where they smoked the meats. I, as a kid, went in there on Saturdays and worked around the plant…. The building expanded [and] my grandfather eventually gave up the butcher shop… My grandfather…would go out to the stockyards and buy the cattle. And, of course the cattle were killed right there…off of Brunswick Street and Wilkens Avenue. Cattle were brought in from the country and sold on the spot there, and around the stock yards you had several abattoirs…and…the cow would be led into one of their plants and that’s where they slaughtered the cow, and my grandfather would have some slaughtered Kosher, some were un-Kosher…. Course then it was trucked into the plant at Lombard and Exeter, and that’s where they operated and sold the beef from. My Uncle Lewis was more or less the one in charge of the beef and the beef sales…. My Uncle Isadore took care of the manufacturing for all the meat products. And I suppose it was 1936 or ‘37 approximately that my Uncle Jerome came into the business. He graduated from the University of Maryland College Park and he took over responsibilities in the office…. My dad Maurice was a salesmen and sold to some accounts in Baltimore, but many accounts in Washington. Traveled over to Washington just about every day. And one of the things he would do in Washington would be to visit all the meat houses in Washington and purchase plates [a cut of meat] and briskets. In those days the people in Washington didn’t know what to do with a brisket or a plate. And they were in excess over there, anxious to get rid of them. And the trucks…would deliver orders to various stores in Washington and would pick up plates and briskets to carry back so they had a load going over and a load coming back. ~Excerpted from Oral History 318, Gordon Salganik, n.d.